The Eastern Wyoming College Livestock Show Team and sophomore Livestock Judging team competed in the Iowa Beef Expo held in Des Moines, IA, February 13-17. Sophomore judgers included Paige Aylward, Dickens, NE, and Regan Streeks, Harrisburg, NE. They judged 10 classes of cattle and gave 4 sets of reasons. Shila Strain, Morrill, NE represented the show team with assistance from Paige and Regan after their events were completed. The Show Team took the lowline bull “LC Imperial Design 7C” which had been donated to the team by Dr. Edwin Bittner. The bull was displayed in the People’s Choice show and sale. The final judging trip of the year was to the Houston Stock Show and Rodeo. Six EWC students went including Aylward; Tracy Austin, Rozet, WY; Ashley Johnson, Wheatland, WY; Tailyn Miller, Cowley, WY; BobAnn Sinks, Jordan, MT; and Kaycee Gobble, Lewistown, MT. The team had the opportunity to practice at the Oklahoma Youth Expo on their way to Houston. “It was a great opportunity for our students to see not only some outstanding hogs but also a chance to see some Brahman cattle before we got to Houston which always has a class to judge,” shared Younglove. Aylward placed 20th in swine out of the 115 Junior College contestants. For more information about the EWC Livestock Show and Judging teams contact Dr. Younglove at 307.532.8374 or by email at georgia.younglove@ewc.wy.edu. The Eastern Wyoming Arts Council presents Gary Small and his band One Earth on Sunday, April 24 at 2:00 pm in the Eastern Wyoming College Fine Arts Auditorium in Torrington. Small is a four time Native American Music Awards recipient, and an accomplished electric guitarist and vocalist. Small is a member of the Northern Cheyenne Tribe whose reservation resides in remote Southeast Montana to the east of the Little Bighorn Battlefield. Small takes great pride in his heritage and talks of his roots proudly and with confidence. Small previously led the Portland Oregon based group The Gary Small Band, a roots rock group of outstanding musicians whose percussion section members include Graham Lear, former drummer of Santana, and former Joe Cocker percussionist, Bobby Torres. Small led this all-star group through myriad music styles of afro-cuban, reggae, roots rock, and blues. Now residing in Sheridan, WY, Small has formed a similar group named “One Earth”. His last album “Hostiles & Renegades” won Best World Music at the Native American Music Awards. Tickets can be purchased from the EWC Community Education office at 3200 West C Street or by calling the Community Education office at 307.532.8213. The Eastern Wyoming College Lancer golf team recently traveled to Otero, Colorado to compete in their annual tournament and brought home the team trophy as well as several individual honors. The Lancers will travel to Lamar, Colorado, March 31-April 1. The Eastern Wyoming College Lancer rodeo team recently returned from competition at the Gillette College Rodeo. In the team roping, the Lancers were led by sophomore Cody Colman, O’Neill, NE. Colman and his partner Tate Mathis, LCCC, were second in round one, third in the short round and third in the average. Sophomore Trevor Schnaufer, Pueblo, CO and partner Ty Spickelmier, NEJC, one the first round with a time of 6.7 seconds. Torrington, WY native Logan Milligan, sophomore and partner Brady McCurry, Otero, split 4/5 in the first round. Also qualifying for the short round in the team roping were the teams of AJ Freeman, sophomore, Dunning, NE and partner Cotey Hansen, Chadron, NE; Savanna Jamison, Ashby, NE and partner Tanner Freeman, Dunning, NE. Cody Lane, sophomore, Torrington, WY, was 2nd in the short round of the tie-down roping and 3rd in the average. Tanner Freeman also qualified for the short round of the steer wrestling. The Lancers will travel to Fort Collins to compete in the Colorado State University rodeo April 8-10. 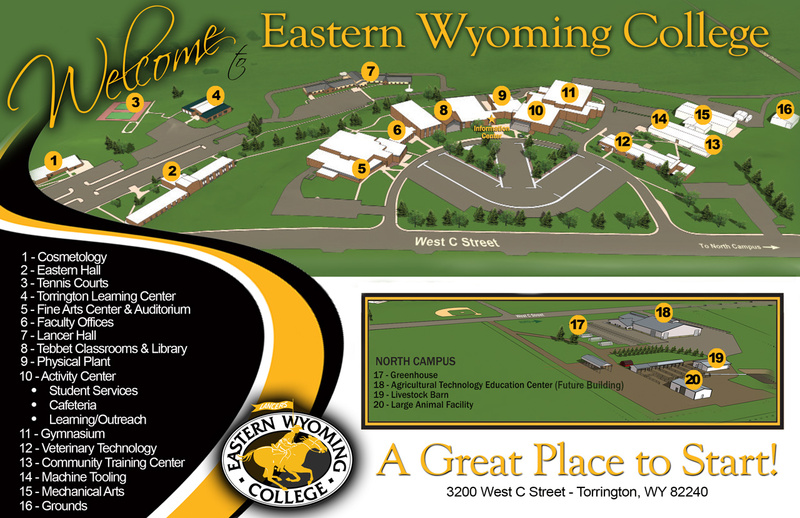 Eastern Wyoming College will once again host a Job Expo on Wednesday, April 6th in Torrington, Wyoming. Approximately 30 employers are expected to participate at this Job Expo and it is free and open to the public. A free workshop to help prospective job seekers prepare to meet employers will be held on April 2 from 9:00 am – 1:00 pm in room 271 in the Tebet building at the campus in Torrington. To register for the workshop please call the WC Community Education office at 307.532-8213. Currently registered participants include Alliance Animal clinic; Animal Clinic, Ogallala, Nebraska; Arby’s; Banner Health; Bloedorn Lumber; Carpet One Commercial Flooring; Cellular Plus; Dillard’s Aveda Salon; Goshen County School District # 1; Ft. Laramie Historic Association; Ft. Laramie National Historic Site; Gallatin Veterinary Hospital; KNEB Radio; McDonald’s; Platte County Sheriff’s Office; Platte Valley Companies; St. Joseph’s Children’s Home; Twin Cities Development; University of Wyoming; USDA Farm Service Agency; WCA Regional Training Center; Welcove Healthcare; Wells Fargo; Western Nebraska Veteran’s home; Wyoming Child and Family Development; Wyoming Department of Vocational Rehab; Wyoming Department of Workforce Services; Wyoming Highway patrol; Wyoming Medium Correctional Institution; Wyrulec. The Community Education office at Eastern Wyoming College in Torrington will be having a Hunter Safety class Monday through Friday April 4th – 8th from 6-9:00 pm and Saturday April 9th from 9 am – noon. The cost of this class is $25. To register for this class, participants are required to register on-line at wgfd.wyo.gov/education, for more information contact the EWC Community Education office at 307.532.8213 or 307.532.8323. The Community Education office at Eastern Wyoming College in Torrington has announced a date change for the Introduction to Loom Beading class. This class will be held on Mondays beginning March 28 and ending on April 2 from 6 – 8:00 pm. The cost of this class is $50.